My Iicx seems a bit dead. I got it to power up a couple times today at random. But now it just clicks. Via switch in back or keyboard. I pulled the supply and jumped the 5v trickle (and it did read 4.97v), same thing. In fact, with it jumped it does the same thing when installed. If I hold the keyboard power or power switch it just clicks non-stop. So pretty sure I ruled out the logic board. I do not have another supply to try. I did leave it unplugged for a while, then plug in and try to boot right away. No go. Left it plugged in for a long while, still no-go. There is no PRAM battery, I do not have a good one to put in. But it seems like it should still boot. Guessing the power supply will need a re-cap, which I am fine with, but I am wondering if anyone has nailed the exact issue. I will keep tinkering and take another look at the power supply. I did already check for cold solder points, etc. Its very clean and "appears" okay less the complete crap job done in the first place. I think there are two relays. But the other is not as obvious to me. I noticed then when pressing the power on the back, the relay click sounds different. Also if I press it after letting it sit, it may not actually click. If I hold it, the relay click gets louder after a couple, sorta ramps up. Then its steady until I wait a while again. Then pressing the rear power but may again not even click on first try. The keyboard behaves differently. Its always a sharp relay click on the first go. So I did jump the obvious looking relay (clear box) and it did not help. I did not install it in the box, but the fan on the supply would not spin up full. Just jump a little with each click as its always done. Oh well, I will keep tinkering. I think if I bypass the other relay I may have an always on supply, but at least it would work for now. I am going to look for schematics and see what else I can find. caps..... in the power supply. Ugh... ya. I guess I better give cap replacement a go. I sorta figured. Its a horrible power supply, really messy soldering. Its a prototype supply I think. So how do you guys figure out which caps you need? Dose all that matter is the specs? uƒ, voltage, temperature, etc? Because some that seem in spec are half the height, etc. Leads match. It would help if the Nichicon series were still used. None match at Digikey for series. From my understanding, this IIci power supply repair guide works with the Astec IIcx PSUs. While mine is an Astec supply, the 5V trickle is fine. The issue I have is that the relay does not stay closed. It just keeps click if I hold either power button or if i have the supply out and jump pins 9 & 10. I have not been able to find anyone with the exact same issue that had a solution. So I am going to have to start with caps. I have a IIci with the same symptoms - power supply clicks, fan lurches, while the power button is pressed. I hooked a meter to pin 10, and it's steady at 5v. I jumpered 9 to 10 to get it to start up, and it does the click, lurch thing. If I work out a fix, I'll post it here. I'm going to dig in and see about leaky caps. In the meantime - does anyone know where I could get a replacement, in case I foul it up worse than it already is? Well my caps JUST arrived! So I will recap and also update on what fixes it. I may replace caps in two or three separate batches to narrow down the issue of those that don't want to replace them all. I just hope I ordered the right caps. Well, seems replacing all of the regular barrel caps had no effect. Same click, click, click and the fan jerking each time. It may be the other caps, but I am not familiar enough with caps to make sure I have the correct replacements. 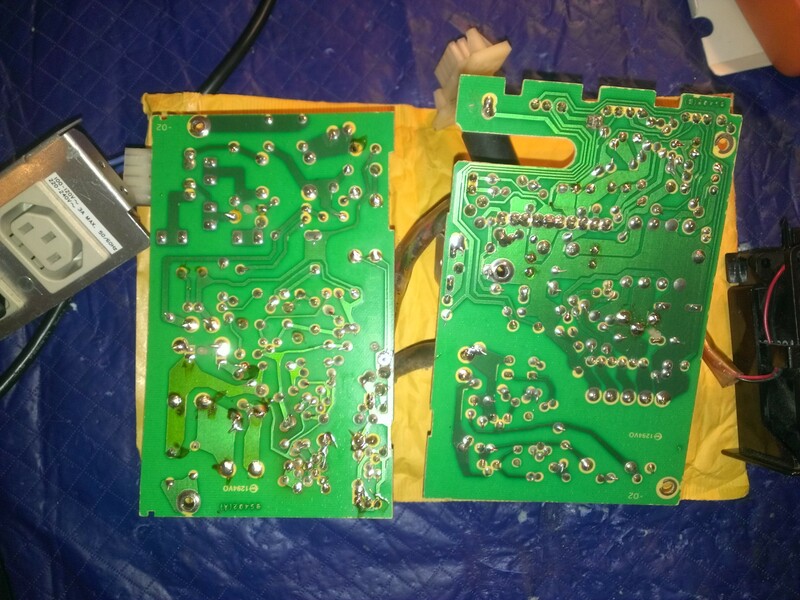 Would anyone happen to have decent resolution photos of the internal Astec power supply boards on the solder side? There are so many solder bridges on this thing, I wonder if I removed one. Trying to figure out where I can go from here. I am going to look into replacing the other style caps. Now I need to see how much matches mine since its a prototype supply.
" With no load connected, the power supply will constantly reboot if you try to "jump start" it, so the output voltages will be all screwed up and the fan will turn slowly." Is that true or not? I read in some places that jumping it should keep it on. Now I read that it will do pretty much what mine is doing - except the fan moving slowly. Now this may just be a difference between the various power supply makers of the Iici, IIcx & 7100. I guess I can toss it back in the box and see what happens. I just like to verify power output of the supply so I don't fry a motherboard. You need to find the rail at which the power supply monitors for its feedback. Maybe 12V? it depends. Once you find this, you put a load on it. AKA, resistor. Maybe a 680ohm or a 820ohm depending on the rail. Also, check your output rectifiers and check the opto-isolator and any TL431s in the feedback stage. this will cause the crowbar-restart syndrome. If you have no load on the feedback rail, it will cause an OVP trip, other words, it will grossly overshoot and the SMPS controller will latched into a timed-shutdown. Usually it restarts, but it depends on the controller. If it restarts and the fault condition still exists, itll shut back down. This is what the tick-tick-tick is. Well I did install it. Same as before. With the power to the HD disconnected, the speed at which is restarts when holding power is slower. I will look into those other components and try to see if I can load it first. There is only one 12v output source, so I will start there. You have a 5V source, 12V source, and some other sources, no? Check all your rectifier diodes on each source and make sure they are not shorted to ground. if you cant figure it out, let me know, I may be able to fix this thing. From this thread I grabbed this image of pinouts. With two separate hard drive, I tried it power it from pin 1 for +. I then tried pins 6,7,8. At 6&7 the relay clicking got rather fast. At pin 8 for ground, the relay held but there was a very quiet clicking (bot to relay). The fan would not even try to spin. The drive would try to spin, but not much and it would cycle like the fan did. With the drive hooked up I did read the 5v supplies. They fluctuated between 2.1 and 3.8 volts. So not sure if the supply is fine but needs a proper load or if its messed up and need some more parts tossed at it. Again. check your rectifier diodes for shorts, Easiest way to do that is diode check using a DMM between each rail to ground. Do you mind checking out the images here? They are as far as I can tell a match to what I have. Normally when I see a rectifier its four diodes. But I only know the very basics. I can understand most things and fix as directed, but I lack the knowledge you do for doing anything beyond basics. So I am a bit out of my realm here. I really do appreciate any help! That would be a rectifier bridge. In this case, the SMPS uses shottkey secondaries, which is only a single diode per rail. If there was a short in one of them, you would get 0 ohms from that rail to ground. Which would cause it to tick. 12v+ (pin 1) to pins 6 or 7, 165 ohm. So from that, if I am reading things right, seems okay? 50 ohms for 5V is eh... well give or take. Something is wrong in there somewhere. What about pins 1 to 8? Should +12v on pins 6 & 7 match in ohm? 6 and 7 are tied together, to ground. Now, since you got a different result between 1 and 8, that means the +12V is split into 2 separate rails. Now, are you doing this in ohms? or are you doing this in diode check? Ohms isnt a valid measurement in diode check, and the results mean something totally different. if you are measuring in DIODE CHECK, then 165 isnt bad. thats actually ok. .045 in diode check is bad.